Fresh out of makeup remover wipes, I rifled through my beauty samples the other day and found L'Oreal Sublime Soft Gentle Micellar Solution ($11.99 at London Drugs). Now I wish I'd rediscovered it sooner. This ultra-gentle micellar cleanser not only removes makeup from face, eyes, and lips, it also gently cleanses dirt and oil without rubbing or rinsing. If you'd like to learn more about how micellar cleansers work, Beauty Geeks has a great explanation of how the molecules—which are hydrophilic and hydrophobic—split open against skin and gobble up makeup, dirt, and oil, in their path. 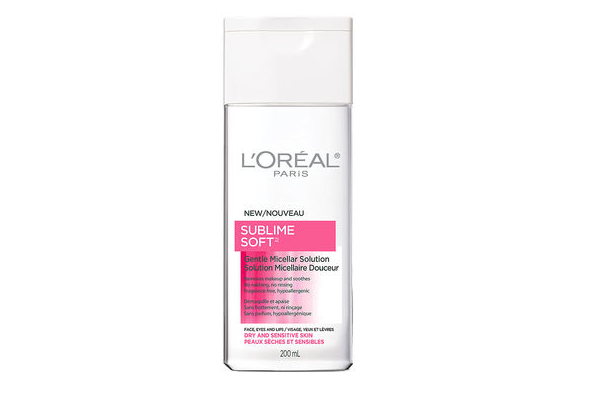 I haven't tried other micellar cleansers so I don't have a point of comparison, but L'Oreal Sublime Soft definitely does what it purports to, removing a face full of makeup with ease. However, its gentle nature means you'll likely have to do 2-3 passes to fully cleanse your face. A couple of tips if you're thinking of trying L'Oreal Sublime Soft yourself. First, find the biggest cotton pads you can so you're not cleansing your face with a dozen itty-bitty ones. Second, apply micellar cleanser once to remove most of your makeup, and a second or a third time to get any traces left behind. And finally, it's okay if you just want to use it as a substitute makeup remover (it doesn't sting!) and use your regular cleanser afterward. The micellar water is so gentle, you won't get that tight, dry feeling you'd feel from over-cleansing. How does this compare to Bioderma? I don't know as this is my first micellar solution, but it's very gentle (emphasis on the gentle). Have you tried Bioderma?